Samantha Cristoforetti is an astronaut of Italian Space Agency (ASI), who was founded in 1988 to provide a single coordinating the efforts and investments that Italy has devoted to the sector until the 60s. It 'a national public body, under the Ministry of University and Research, and works in collaboration with several other departments. In just over two decades it has established itself as one of the most important actors on the world stage of space science, satellite technologies, the development of means to reach and explore the cosmos. The ASI has now a leading role both at European level, where Italy is the third country that contributes most to European Space Agency, as worldwide. 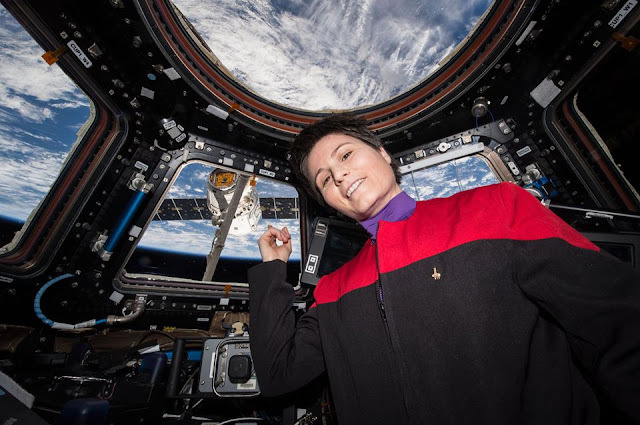 In fact a close and continuous relationship with NASA, which leads her to participate in many of the most interesting scientific missions of recent years. One of the most fascinating is the construction and operation of the International Space Station, where astronauts Italian are now at home. Thanks to the activities of the ASI, the Italian scientific community has achieved unprecedented success in recent decades in the field of astrophysics and cosmology, including helping to rebuild the first instants of the Universe, making crucial steps towards understanding of the phenomenon of gamma ray bursts and the mysterious gamma-ray sources. The ASI has also given important contributions to space exploration, building scientific instruments that have already traveled by NASA and ESA probes to discover the secrets of Mars, Jupiter, Saturn. And in all major missions planned for the coming years - from Venus to the comets, up to the very limits of our solar system - there will be a piece of Italy. In addition to studying the Universe, from space you can see the Earth to predict and prevent - for example - environmental disasters, ensure rapid interventions in crisis areas, to measure the effects of climate change. Even in these fields Italy leads the way with systems like Cosmo Sky-Med's flagship programs ASI turned to the knowledge of our planet. Italy, through the ASI and Italian industry, also continues a tradition of research in space propulsion, especially as leaders of the European VEGA program, the small launcher of Italian design. Today, however, the space is not only an extraordinary research. It 'also an important economic opportunity. The market for telecommunications and satellite navigation - just to mention a range of applications - is constantly expanding and the ASI, with his experience in the construction of satellites into orbit, operates because Italy is ready to grasp opportunities. The fundamental questions about the understanding of the universe, the origin of life, to the experimentation of new technologies, the space appears more than ever the place from which to expand the cultural horizons of man, raise their awareness and ensure a better future on Earth. Thanks to ASI, Italy is in the forefront in this exemplary human enterprise.